We microwaved our sweet potatoes and beans because shortcuts! Feel free to used roasted sweet potatoes and cooked black beans to achieve the same results, with a little more love. Curious about the carton you see below? 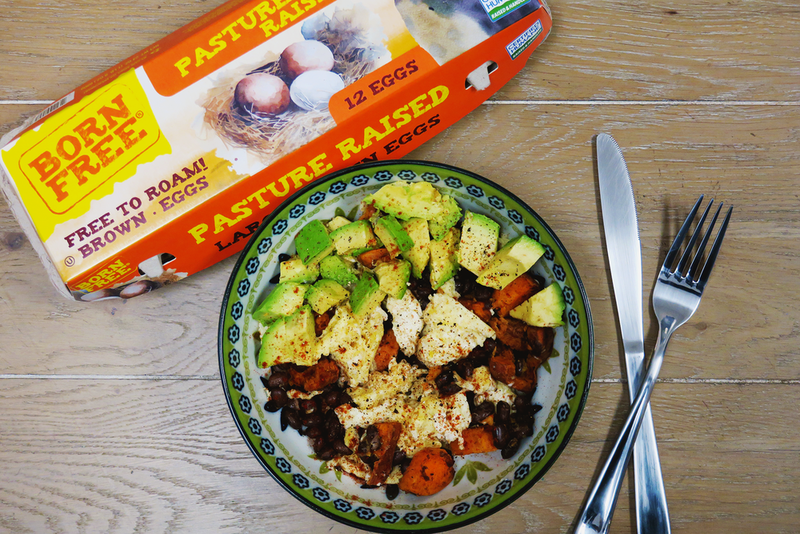 Our first pasture-raised farm’s eggs can be found in these cartons under the Born Free brand at your local Lowes Foods, Food City or select Weis stores! Wash sweet potato and wrap with damp paper towel and microwave for 4 minutes or until the sweet potato is soft but skin does not break. Allow sweet potato to cool for about 1 minute, then dice into bite-sized pieces. Warm olive oil in a medium skillet and add sweet potatoes. Gently sautee the sweet potatoes until they are coated with the olive oil, then add 1/2 tsp. cumin, 1 tsp. paprika, and garlic salt and cook for about 3 minutes. Add in black beans and the remaining cumin and 1/2 tsp. paprika and incorporate together with the sweet potatoes. Cook on medium for another 3-5 minutes. Beat eggs in small cup or bowl and add to a greased skilled on medium to low heat. Scramble the eggs to desired doneness. Add in the sweet potatoes and black beans and cook on low for about one minute. Remove from heat, place scramble in dish of choice. Add in diced avocado and garnish with remaining paprika, sea salt, and cracked pepper.